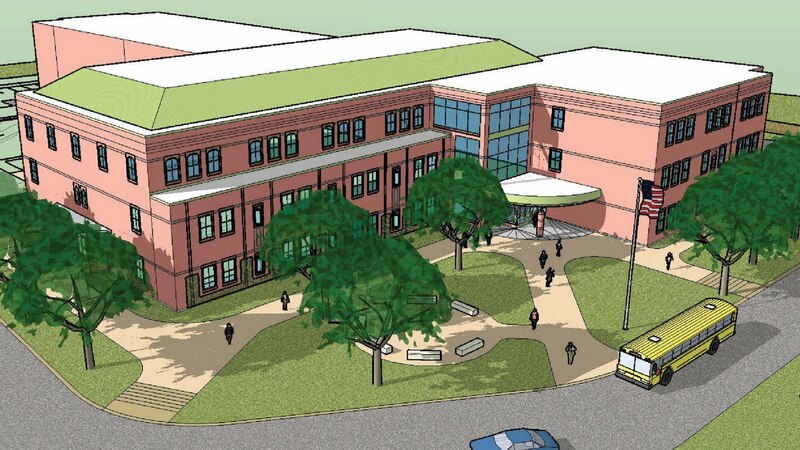 Artist rendering of Pinkerton's Freshman Academy, projected to open Fall of 2011. DERRY – Construction has already started on the expansive Freshman Academy, a $23 million project on the fast track to completion by the fall of 2011. Last night the new building was the subject of a brief presentation to Pinkerton Academy Board of Trustees and some school board members from the three sending towns. Although much of the territory covered was familiar, there were revelations – most notably, the price tag for the 130,000-square-foot academy, which comes in $6 million under the original cost of the project when it was first proposed in 2008. One difference is that a $4 million field project, included in the original plan was eliminated when the building plan was revived last fall. “If ever there was a time to build a building, this is the time,” said the school's Head Master Mary Anderson. Her comments followed several Power Point screen shots detailing the financial end of the building project. Financial Administrator Glen Neagle pointed to the current competitive climate among sub-contractors and a recent boost in the school's rating by Moody's Rating Service, along with some refinancing of existing debt, which amounted to a $2 million reduction in overall construction costs. Based on just construction costs and related expenses, the change in tuition per student would be about $300, said Anderson. Other considerations like salary increases and merit pay would have to be factored in. “This school is run like a business, and that makes a huge difference. We want to maintain the array of courses that make us what we are,” Anderson said. The $23 million project will also rid the campus of its 40-year-old portables. “All things considered, this is really at the heart of it. I want those portables gone,” said Anderson, who said she will be first in line when the bulldozer arrives. Derry School Board member Ken Linehan said his main concern has always been the scope of the project, and what the long-term plan is for the school.